I love to find ways for children to create and express themselves, especially when that involves putting their thoughts into a digital story. 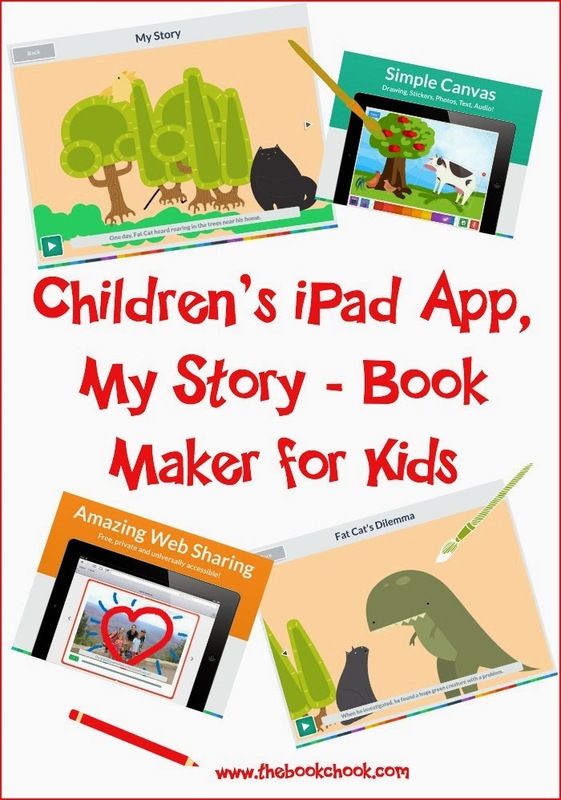 My Story - Book Maker for Kids is an iPad app that facilitates creating with photos, voice, stickers, drawing and text, resulting in an ebook that can be shared various ways, including to iBooks. You can see two screen grabs from the test story I made about Fat Cat in the image above. From the developers: Create and share ebooks and stories by adding drawings, photos, and stickers. Then record your voice on every page and share your story with friends, family and classmates. We’ve made My Story super teacher friendly by adding multiple authors and syncing across multiple iPads! So now you can have all your classroom iPads in sync! Perfect for the home or classroom. What I liked: There are lots of good features in this app that encourage kids to engage in telling a story. Kids will love the decorative element - they can draw, paint, add a photo, add stickers (clipart provided.) Parents and teachers will appreciate the ease of use, the syncing capability, the sharing options, and the fact that kids will not only want to share their own stories, but to read others. My wish list: I would love a way to do more editing of images e.g. face them in the other direction. I couldn’t find that function. I also wish captions could be longer. And that there was an editable speech bubble sticker. Greedy, aren’t I! Wish list aside, this is an excellent way for kids to create a digital story. It's mainly about kids recording an oral story - but most will need to write first, to storyboard or organise their thoughts before recording it. It’s attractive and that’s a huge plus with an app that’s also solidly educational. Find more of my reviews and articles about using iPads with kids on my Pinterest board. Hi Susan! We recently updated My Story and added some of the features you wanted to see! We'd like to hear how you like the latest version! All the best!